We are flying northwestward through the Hants lowlands, and look! The huge hole is the largest gypsum mine in the world! 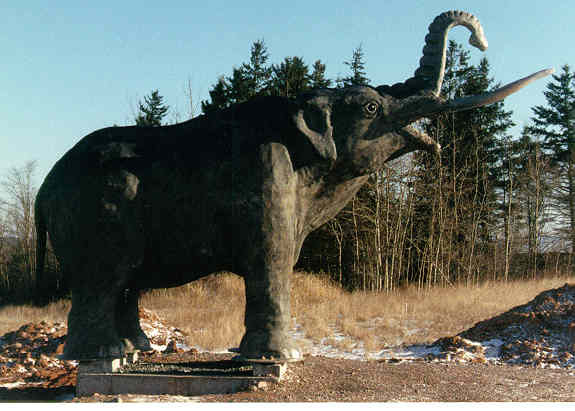 In addition to gypsum, the mine has produced an unexpected economic output, a cottage industry of mastodon statues and mastodon theme malls. But more on that later … let's land! Summary for non-geologists: In the quarry, resting on gypsum bedrock, is a record of Pleistocene sediments dating back 209 ka (ka = 1000 years ago). There was a major ice advance approximately 209 ka, followed by a lengthy warm period called an interglacial. During this period, which lasted from 125 to 79 ka, the climates in Nova Scotia fluctuated from as warm as southern Georgia, U. S. A., to as cold as northern Quebec. During the last cold phase of the interglacial, mastodons roamed Nova Scotia, and one fell in some muck in a sinkhole and died. Later, several glaciers passed over the quarry and the mastodon protected in the sinkhole, covering it with 30 m of glacial deposits. The National Gypsum Company stripped off these glacial deposits to reveal the beast. For those of you taking cars and following the chopper (tough job!) take Highway 2 for 5 km north of the Lantz quarry until you see a sign for the National Gypsum (Canada) Quarry. Click for a location map. 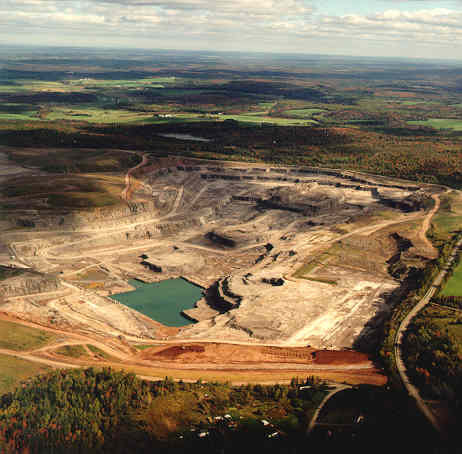 Since the quarry opened in 1954 many geologists have made observations at the site. This is a summary of those observations. Quaternary sediments rest on an irregular, karst gypsum bedrock surface. The karst is manifest as steep-walled, scoured, linear and ovoid channels varying from a few metres to tens of metres in depth. The oldest recognized surficial sedimentary unit is a black, lignite-bearing clay with thin (1-2 cm) sand laminae, plastered onto gypsum bedrock. Veinlets of gypsum penetrate this unit, which is Cretaceous in age, based on fossil pollen (R. Fensome, personal communication, 2002). The black lignitic clay is similar to Cretaceous deposits at Gays River, Shubenacadie and Musquodoboit in the Hants Lowlands. Dark grey, "rubbly" or "gypsiferous" tills have been described on the gypsum surface and at the base of some karst channels. 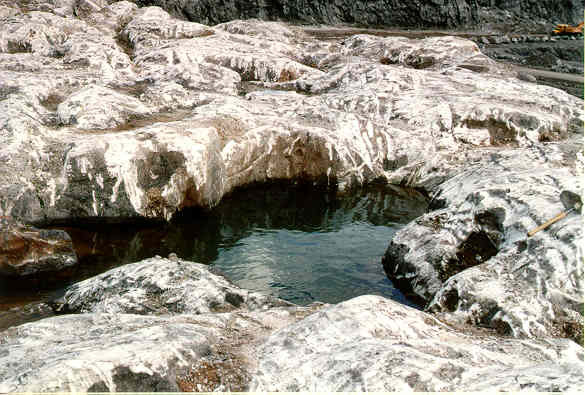 The lowest till is called the Miller Creek Till, named after a type locality in a gypsum quarry near Windsor, Nova Scotia. At the type section the Miller Creek Till underlies a thick peat and wood layer and has soil developed on it, suggesting an interglacial interval of some duration. Within the karst sinkholes the apparent stratigraphic relations are unclear due to solution collapse or subglacial deformation. Infilling some sinkholes is a pebbly clay with shell horizons, and peat lenses. Wood fragments are found throughout, but concentrated in the upper peaty layer. Look at a schematic section showing the main stratigraphic units. The sinkhole organics include gastropod and pelecypod shell layers and small wood fragments including some beaver-cut sticks and bones. In 1991 Stanley McMullin, a grader operator, noticed a tusk in some fill that he was excavating from a sinkhole. Scientists from the Nova Scotia Museum eventually uncovered the nearly complete remains of an adult and juvenile Mastodon ( Mammut americanum). These include skull, (with tusk and teeth disarticulated), scapula, thoracic vertebra, ribs and femur bone fragments (Grantham and Kozera-Gillis, 1992). A few pollen samples from the sinkhole organics revealed a homogenous conifer-dominated assemblage, consistent with a cool boreal forest environment. Wood ( Pinus banksiana) found near the mastodon bones was dated at >51 ka (see section). See what a reconstructed mastodon looks like here, standing guard over a local shopping centre. Peat layers above the gypsum surface can be divided into two pollen zones, a lower zone containing hardwoods, including Tilia (basswood), Fagus (beech)and Acer (maple),and an upper zone characterized by coniferous pollen, mainly Abies (fir).The presence of the carabid beetle, ( Pterostichus patruelis) in the upper zone, with a range in northern Quebec today, indicates a cooler boreal climate. Uranium series ages of 84.2 ka and 84.9 ka were obtained from wood fragments from the upper unit. These organic deposits probably span a lengthy nonglacial interval. In their synthesis, Mott and Grant (1985) differentiated three types of pollen sequences, termed Palynostratigraphic Units 1-3. Unit 1 spectra are characterized by pollen indicative of climatic conditions warmer than present and forests containing abundant white pine and hardwoods. At East Milford the pollen record is restricted to Palynostratigraphic Units 2 and 3, indicating climate similar to the present followed by cooler boreal coniferous to tundra conditions during Unit 3. See section. The forests at East Milford grew during the Sangamon Interglaciation (125-75 ka) between the Illinoian and Wisconsinan glaciations. Deposits of the last interglacial are beyond the 50 ka limit of radiocarbon dating. U/Th age dates on wood seem to confirm a Sangamon age for most of the beds, but the youngest unit (Unit 3) produced some Mid-Wisconsinan ages in other areas (Mott and Grant, 1985). Because of the strong possibility of parent U migration, the younger dates are probably minimum ages. Recent dating of the sinkhole organics by optical luminescence has produced ages in the range of 135 ka, confirming a last interglacial age (Godfrey-Smith and Stea, 1995). The mastodon tooth enamel, however, produced an age of 74.5 ka, closer to the U/Th wood ages. From this discrepancy, Godfrey-Smith et al. (2002) concluded that the mastodon and older peat were mixed together as the animal sank in the mire. 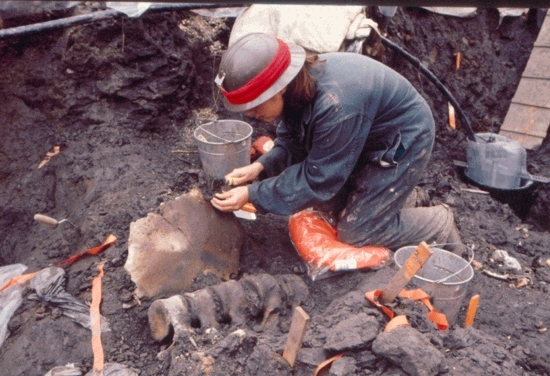 This mixing of young bones and older peat was later augmented by glacial loading. Look at a table of all the age dates from the East Milford Quarry. This photo shows a section of Quaternary sediments above the gypsum surface. The red sediments on the top are tills, and the bedded sediments near the base are sand and gravel containing fossil wood. The overlying reddish silty till, called the East Milford Till, forms much of the topography of the Hants Lowlands averaging between 10 and 20 m in thickness. The East Milford Till is Early to Middle Wisconsinan in age and formed during the Caledonia Phase. 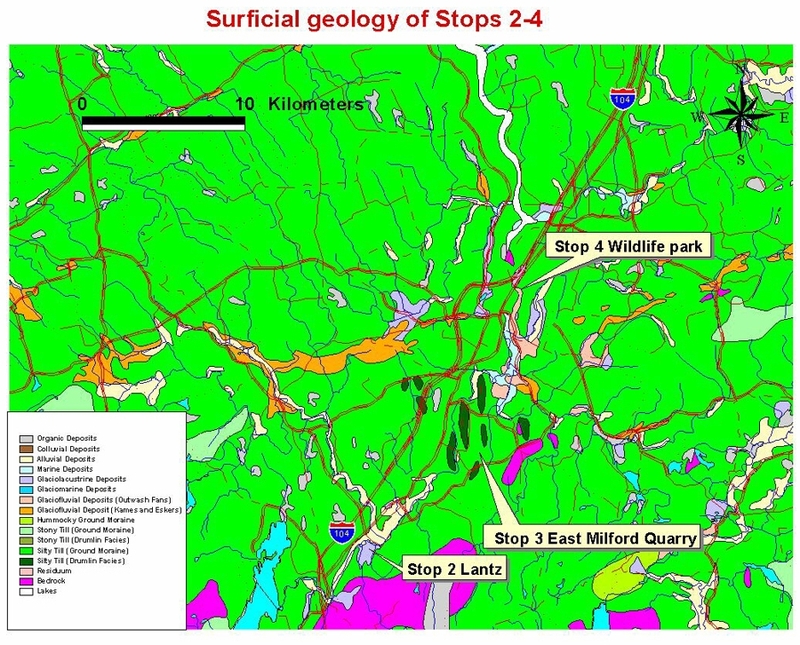 Overlying the East Milford Till are clay-silt, sand, gravelly sand and gravel beds. The surface till, called the Hants Till, was deposited by southward flowing glaciers (correlative with the Lawrencetown Till on the Atlantic coast)and later reworked by local ice caps. A problem plaguing Quaternary geologists in eastern Canada is the absence of tills/organics relating to previous glacial-interglacial cycles. Early Cretaceous sediments have been found on the gypsum surface, directly overlain by Sangamonian organic sediments with no glacial deposits intervening. Twenty-two glaciations have occurred in the last 2 million years, but glacial records pre-dating the Illinoian (Marine Oxygen Isotope Stage 6) have not been documented in Atlantic Canada. Godfrey-Smith, D. I., Grist, A. and Stea, R. R., 2002. Multidisciplinary absolute chronology of a pre-Wisconsinan mastodon fossil locality at East Milford, Nova Scotia, Canada; 10th International Conference on Luminescence and Electron Spin Resonance Dating, Reno, Nevada. Godfrey-Smith, D. I. and Stea R. R., 1995. 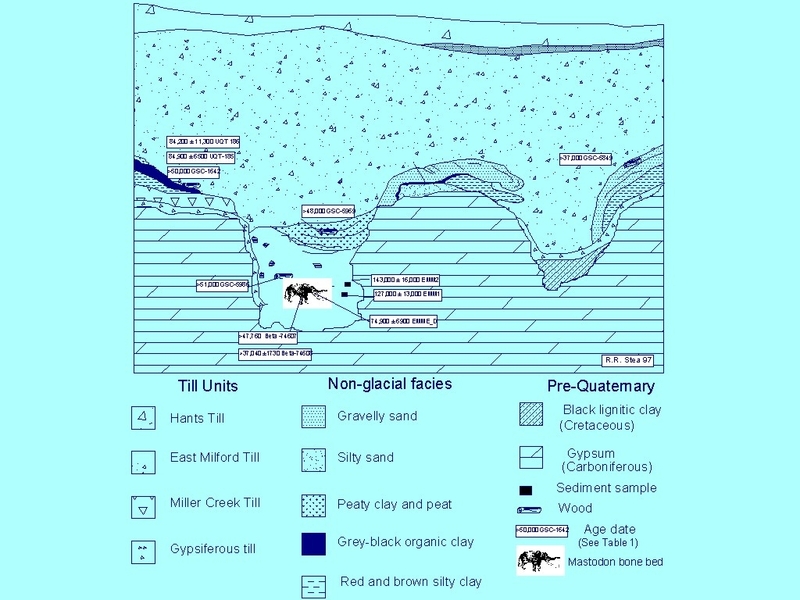 Last interglacial geochronology of a mastodon locality at East Milford, Nova Scotia, Canada; Abstract, Annual GSA Meeting, New Orleans, U. S. A., Nov. 4-6, 1995. Grantham, R. G., and Kozera-Gillis, K. A., 1992. 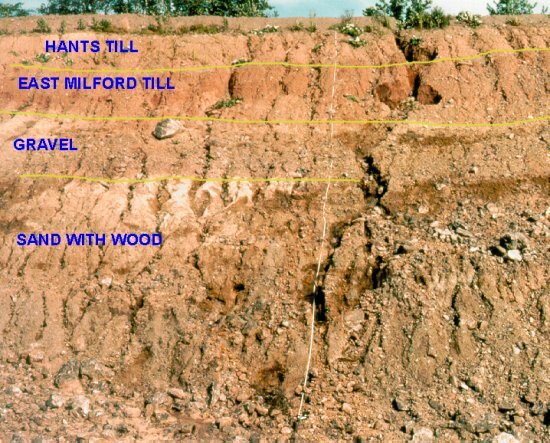 The East Milford mastodon dig progress report; unpublished report, Nova Scotia Museum of Natural History. Mott, R. J. and Grant, D. R. G. 1985. Pre-Late Wisconsinan paleoenvironments in Atlantic Canada; Géographie physique et Quaternaire, v. 39, p. 239-254.